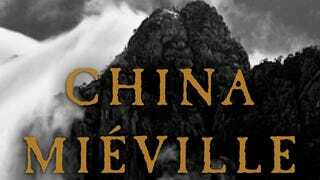 It’s been way, way too long since the last China Miéville novel, 2012’s Railsea. Now at last, the master of strange, thought-provoking worlds has a book coming out early next year, This Census-Taker. And we’ve got an exclusive first look at the cover as well as an excerpt! In a remote house on a hilltop, a lonely boy witnesses a profoundly traumatic event. He tries - and fails - to flee. Left alone with his increasingly deranged parent, he dreams of safety, of joining the other children in the town below, of escape. A boy ran down a hill path screaming. The boy was I. He held his hands up and out in front of him as if he’d dipped them in paint and was coming to make a picture, to press them down to paper, but all there was on him was dirt. There was no blood on his palms. He was nine years old, I think, and this was the fastest he’d ever run, and he stumbled and careered and it seemed many times as if he would fall into the rocks and gorse that surrounded the footpath, but I kept my feet and descended into the shadow of my hill. The air felt wet but no rain had fallen. I sent up cold dust behind me and little animals scuttling ahead. People in the town saw that cloud long before I arrived, Samma would later tell me. When she could tell that it wasn’t just weather, she was one of those who came to wait by the pump beyond the bridge to the west, where there were the last buildings, to watch whatever was coming. After that day, when I saw her, when she could, Samma would tell me stories, including the story of when I came down the hill. In I’d come. I turned with the path, away from where the slope grew drier and stonier and inclined precipitously, and I ran for where the crowd was waiting. I could see down spaces between those outmost walls to the town’s built-up bridge. I was weeping so hard I retched, came loud and filthy past the wire-spinning mill and the glassworks, past barns and stores and the ground before them strewn with old straw and the shards of things that had been broken within, toward the cobbles and concrete in view of that bridge itself, where the townspeople waited. There were children among them: those with adults were held back by them. I made noises as if I were a whooping baby. I struggled for air. I was the only one moving while all there stared at my little figure raising dirt, until someone, I don’t know who, started forward to meet me, and they brought others after them in shame, Samma among them. They ran to me with their own arms out like mine, to take me. I kept up the hands I thought were bloody for them to see. From the forthcoming book THIS CENSUS-TAKER by China Miéville. Copyright © 2015 by China Miéville. Reprinted by arrangement with Del Rey, an imprint of Random House, a division of Penguin Random House LLC. All rights reserved.